Hamilton's Reid Coolsaet narrowly missed the Canadian marathon record on Sunday, finishing third in an unofficial time of two hours 10 minutes and 55 seconds. However, he will compete at next summer's London Olympics along with fellow Canadian Eric Gillis. Reid Coolsaet took a risk in the Scotiabank Toronto Waterfront Marathon on Sunday, walked away with a berth in next summer’s London Olympics, and nearly a Canadian record. The 32-year-old from Hamilton narrowly missed Jerome Drayton’s 36-year-old mark, crossing the line in an unofficial two hours 10 minutes and 55 seconds for a third-place finish. Drayton ran 2:10:09 in Fukoka, Japan, in 1975. "I decided to roll the dice and [run] with the leaders," Coolsaet told CBC’s Scott Russell after the race. "I wanted in the middle but because of the wind I had to pick [a race position]. "It was a lot faster than I had planned going out. I thought I’d take a risk today and it kind of blew up in my face at 36, 37 [kilometres]. I didn't think I was running fast anymore and was just happy to be in third overall at that point. Then I came around the corner and saw the clock and was pleasantly surprised to have run a PB [personal best]." 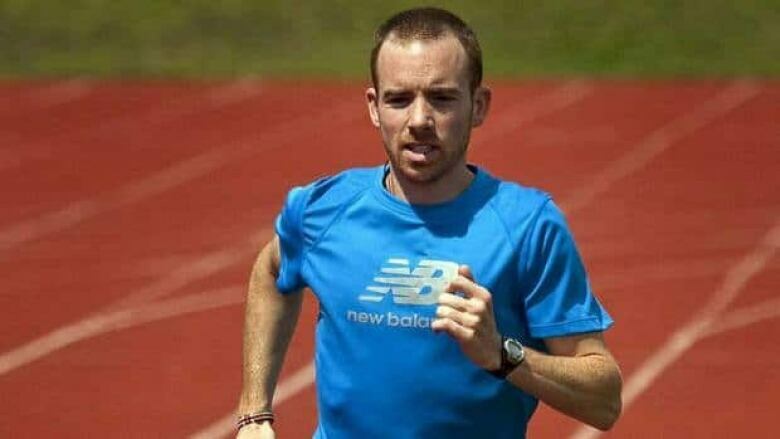 Coolsaet did meet the Canadian Olympic standard of 2:11:29, and will be joined in London by Eric Gillis of Antigonish, N.S., his training partner at Speed River Track Club in Guelph, Ont. Coolsaet posted his time despite having to take a washroom break at about the 25 km mark. "It didn't take too much time but obviously I lost contact with the front pack," he said. "Luckily I had a pacer and clawed my way up the next three kilometres and got myself up with that front pack again." Gillis finished fourth Sunday in an unofficial time of 2:11:28 while Dylan Wykes turned in the third-best Canadian performance. "I could've just as easily been one second over," said Gillis. "I feel really, really lucky to get that [Canadian Olympic] standard. I couldn't have done it this time last year, I just wasn't in the right frame of mind to go after that. Things are working out well now, things are clicking." Kenneth Mungara of Kenya won Sunday's Toronto marathon for a fourth consecutive year. He finished in 2:09:51 and Ethiopia's Shami Abdulahi Dawit was second. "This was a very good day for me but it was very tough because it was very windy and cold," Mungara said. Coolsaet, who ran more than 200 km a week to prepare for Sunday's marathon, previously ran 2:11:22.5, but that was prior to the official London Olympic qualifying period. At last year's Toronto marathon, the University of Guelph alumnus recorded the fifth-fastest marathon time for a Canadian. Bruce Deacon is the last marathoner to represent Canada in the men's event at the 2000 Sydney Olympics, where he placed 44th. Gillis, 31, ran for Canada at the 2008 Beijing Olympics and finished 33rd. He moved to Guelph five years ago and made his marathon debut last year in Houston, where he posted a time of 2:13:52, more than two minutes longer than Sunday's performance. "It was not perfect out there [with the cool, blustery conditions]," Gillis told Russell after the Toronto marathon, "but we did what we had to do." Gillis said despite the weather conditions, he felt very good physically through the first 34 kilometres of the race and was on pace to qualify for London comfortably. But that all changed near the end. "With 300 metres to go, I wasn't sure," he said. "I just knew I had to put my head down and get up on my toes as much as I could. "The support [in Toronto] is amazing," Gillis told the CBC. "This is officially a big-city race. I welcome everyone to come, either race, participate, watch, raise money. It's an amazing event." Coolsaet said also having Gillis qualify for London will prove beneficial to both runners. "Just the fact that now we can work together for the same marathon again is a huge benefit for both of us," he said. "It works both ways and we're really excited to be able to focus on London from here on in." Ethiopia's Koren Yal was the top female finisher in 2:22.43, with compatriot Mare Dibaba second in 2:23.25. Vancouver's Katherine Moore was eighth in 2:48.48. Meanwhile, police said a 27-year-old man died after collapsing while running in the event. He was taken to St. Michael's Hospital, where he was pronounced dead.